Can be used on any type of track or road. Allows you to move over difficult terrain: holes, stones, ditches. If you need to go through scrub, over rocks or through a deep river, you can carry the trailer using the rucksack straps. If you're going through undergrowth where there are low branches, you can lower the carrying arms using the telescopic tubes. 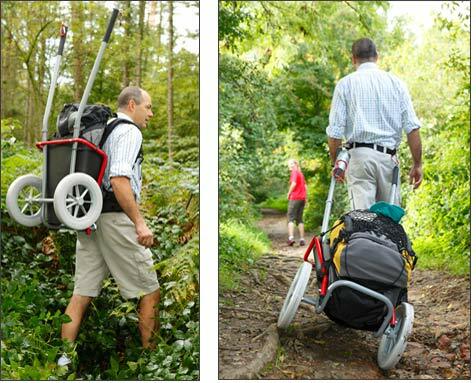 The 31 cm-diameter wheels make it easy to go over large stones. You'll find it's ever so easy to turn around if you need to either get something out of the trailer or put something in (pullover, flask, etc.). A flask and holder come as an optional extra (Ref. A402C). A luggage net with a 55 x 45 cm pocket comes as an optional extra (Ref. A403C). The cradle which accommodates the bag is conical in shape so that the rucksack can sit firmly in its natural position. Nevertheless, there is an accessory provided to make the cradle rectangular, so that it can hold a square or rectangular box (maximum width: 40 cm). There is a soft plastic bottom to protect the bags which are being carried from water and/or mud. 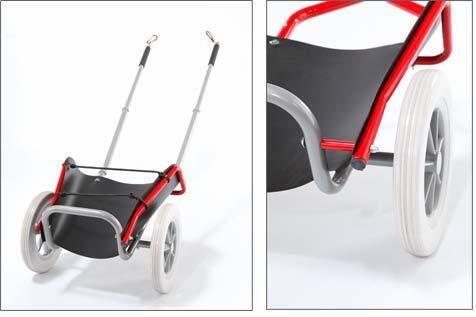 The carrying arm tubes can be folded away in a matter of seconds, and the whole trailer can be taken apart in 10 minutes for easy storage. As an optional extra, you can buy our adaptor ref. A410C for converting the hiking trailer into a bike trailer.